Toulouse took on Rennes on Friday, falling 1-0 thanks to a goal from Yoann Gourcuff. 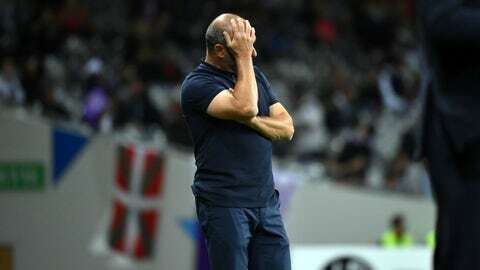 The real L of the day came from Toulouse coach Pascal Dupraz though, as he produced the most epic dive of all time after being tackled by… a paper plane. A fan tossed a light ballistic missile made from paper down from the stands, and when it hit Dupraz, he reacted like he'd been tackled from behind by a Mack truck. He went down to his knee and needed treatment before bravely soldiering on and finishing out the rest of the match. The best part? It took him a couple seconds after the paper plane hit him to react and fall to the ground in shock, awe and pain. Unfortunately, he couldn't inspire his team to victory after his brave return, but this episode will live on long after everyone forgets the result against Rennes.